When packing up the kids for college, it’s almost a requirement to send them off with what seems like an unlimited supply of ramen noodles — those instant noodles that any freshman can make on his or her own. Add water, find a microwave, and eat up. While I’m sure it’s common knowledge these skinny noodles aren’t too nutritious, health experts warn they are not the best option for those living the dorm room life, serving up a few tips to help these students stay healthy. A study released in the August issue of the Journal of Nutrition found that eating instant noodles two or more times a week increases the likelihood of developing heart disease and other conditions, including diabetes and stroke — especially in women. The study tracked the diets of more than 10,000 adults ages 19 to 64 and found they had an increased risk of suffering from cardiometabolic syndrome, which causes symptoms including high blood pressure or blood sugar, among others, which affect one’s metabolism. Lara McNeil, a registered dietitian with East End Nutrition in Riverhead and Greenport, explained why the little noodles pack such a big punch for those who eat them. “Ramen noodles are a highly processed convenience food that contains little nutritional value beyond empty calories, sodium, and saturated fat,” she said. 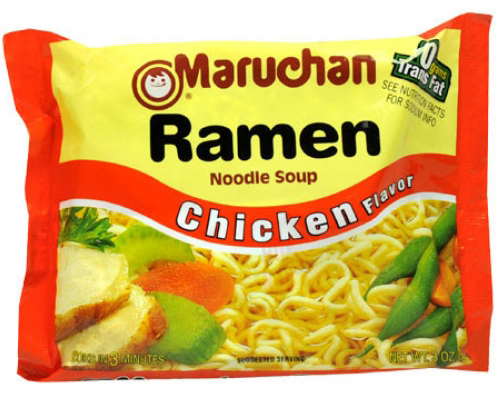 According to the product’s nutrition label, one chicken-flavored Maruchan brand “Instant Lunch” — conveniently packaged in an easy to clean up Styrofoam cup — boasts 1,190 milligrams of sodium. “That’s nearly half the recommended daily intake,” she said. The recommendation is less than 2,300 milligrams of sodium per day. And for several demographics — if you’re age 51 or older, if you’re African American, have high blood pressure, diabetes or chronic kidney disease — you’re recommended to consume just 1,500 milligrams of sodium a day, according to the Dietary Guidelines for Americans. Researchers noted that some companies also use the controversial chemical bisphenol A — more commonly known as BPA — in the Styrofoam packaging, said Hyun Joon Shin, lead investigator for the study, in a release about its findings. Dr. Shin noted BPA could play a role in why women are at greater risk from consumption, as it “interferes with the way hormones send messages through the body, specifically estrogen,” a release about the study reads. It’s important to remind those eating ramen noodles that water should be heated in a separate container and added to the Styrofoam cup. The cup should not be put in the microwave because it can release more of the BPA chemical from the Styrofoam, researchers said. Ms. McNeil said instead of the instant options, students should stock their dorm rooms with choices that contain both a protein and a carb source, and be sure to eat enough when hitting the cafeteria. “When they leave the cafeteria they should always walk away with a healthy snack for their rooms, such as a piece of fruit and a small bagel,” she said. She noted that if you don’t eat right all day, you will tend to overeat at night, which equates to added pounds — and that goes for everyone.